Brentwood County High School host annual book awards! 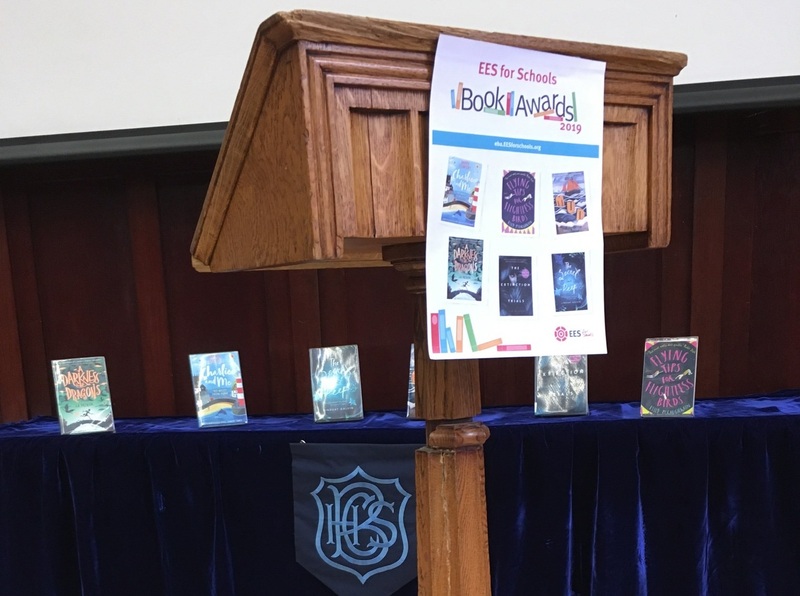 On Tuesday 19th March the Brentwood County High School hosted the EES for Schools’ Essex Book Awards. Students from across Essex had been given the task to read a selection of shortlisted books and choose their favourite. The winner was announced on the day and presented with an award. To develop their understanding of the stories further, were given the task of making a short film that reflected the synopsis of their favourite book. The films were presented ahead of the award ceremony, in front of a packed out school hall, which included a few of the shortlisted authors. Brentwood County High School’s librarian, who received a Leader Award from the Jack Petchey Foundation, decided to put the school’s Small Grant from her award towards purchasing new tablets, which they used to create their short film. 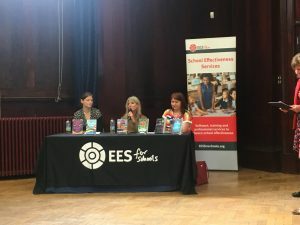 230 students from across 16 schools in Essex attended the event, where they got to meet and talk to three of the authors of the shortlisted books. The awards had encouraged students to read various styles of writing as the shortlisted titles all explored different themes. The shortlisted books, which all fell under the YA category, were: The Secret Deep by Lindsey Galvin, Mud by Emily Thomas, Charlie and Me by Mark Lowery, A Darkness of Dragons by SA Patrick, Flying Tips for flightless birds by Kelly McCaughrain and The Extinction Trails by Susan Wilson. Emily Thomas, Kelly McCaughrain and Susan Wilson were all able to attend the event. Before the winner of the top book was announced, each of them stood up on stage to speak about their book, what inspired their stories and what advice they would give to those with a passion for reading and writing. They all participated in a Q&A session with the students too. Pupils were encouraged to ask the authors all about their writing processes and more about their books. This was a brilliant opportunity for the young people to get more of an insight into their work and how to write a book. To determine who would win, all of the students had been asked to write a review on a blog about their favourite book, why they enjoyed it and what they learnt from it. Over 400 reviews were posted online about the books. This encouraged the young people to think about what they had read and explain the book in their own words. Susan Wilson, author of The Extinction Trials, was announced as the winner of the students’ favourite book. Her story was full of adventure, with dinosaurs at the centre of everything. She explained that this came from realising that there were not many books out there for her sons to enjoy, so she decided to write one herself – alongside her full-time job as a nurse! Miss Ryan, Head of School for BCHS said “An award voted for by children is perhaps the greatest accolade a children’s novelist could wish to receive. We place great emphasis on reading for pleasure at BCHS and were proud to host this event”.